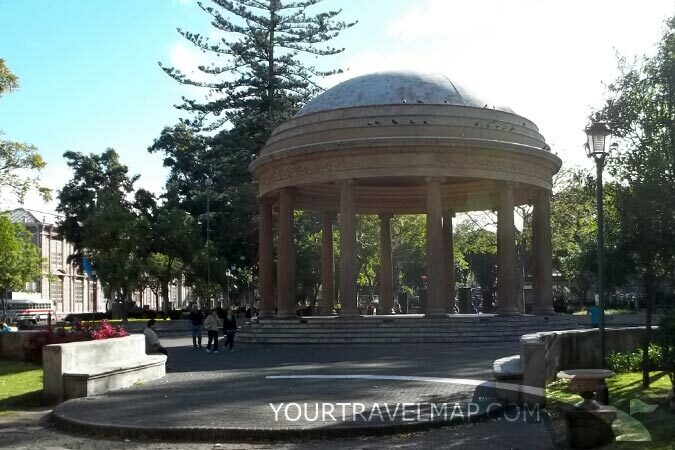 Parque Morazan is one of the many San Jose city parks. 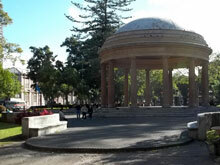 Since 1823 San Jose has been the capital of Costa Rica. Many tourists start their vacations in the capital and with some of them expecting something else. Because of the altitude it is not as hot in San Jose and the traffic can be slow during rush hours. 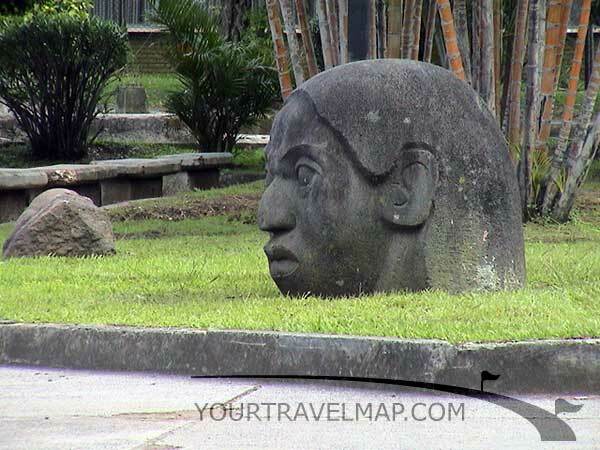 But San Jose is the hub of Costa Rica and it is hard to avoid it, no matter if you are a tourist or a Costa Rican. San Jose is home to most of the universities in the country, important companies, the best hospitals and museums and many places of interest. The major airlines and bus companies operate from San Jose. Those who want to switch from the Pacific to the Caribbean coast or vice versa have to drive thorough the capital, or at least very close to it. Even the legendary Panamerican Highway goes through San Jose. 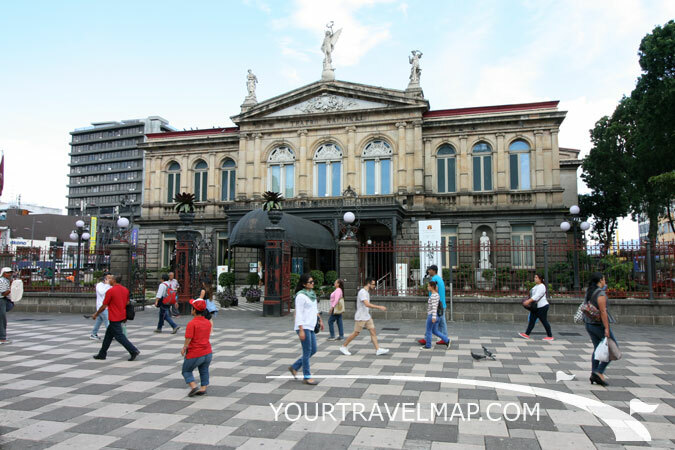 The National Theater is one of the sights of San Jose, the capital of Costa Rica. 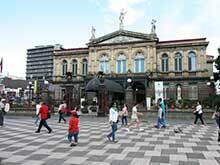 The national theater, the best known building in Costa Rica, is located at the Plaza de La Cultura. The construction was solely financed by a tax on the coffee exports and the national theater was finished in the year 1897. The Italian painter Villa painted the ceiling of the staircase. It shows workers loading Coffee and bananas in the harbor. The motif is printed on the old five colone bills, they are still sold as a souvenir. Other attractions in the capital of Costa Rica are the jade museum, the national museum, the gold museum and the museum for children. The national museum is located in a former fortress and the children's museum is located in a former prison. 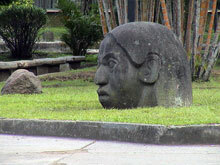 This sculpture stands in front of the Costa Rica Art Museum in Sabana. There are several nice parks in the center which have a tropical flair thanks to the palm trees. The big Sabana Park is located west of the city center, sports enthusiast especially frequent this place on the weekends. There are basketball, baseball and tennis courts in Sabana Park, but as always the Costa Ricans favorite sport is soccer. The east side of the park is home of the former airport building which is now the Costa Rican Art Museum. It was built as an international airport in 1940 and has been a museum since 1978. San Jose is the capital of Costa Rica since 1823. San Jose is the capital of the province of San Jose. Till 1823 San Jose was an insignificant small village. Distance from Liberia to San Jose: 211.3 kilometers respectively 131.3 miles. Travel time from Liberia to San Jose: 4.05 hours. Those who have some time at the start or end of their visit to Costa Rica won't get bored in San Jose.